It should be entered into with abandon or not at all. 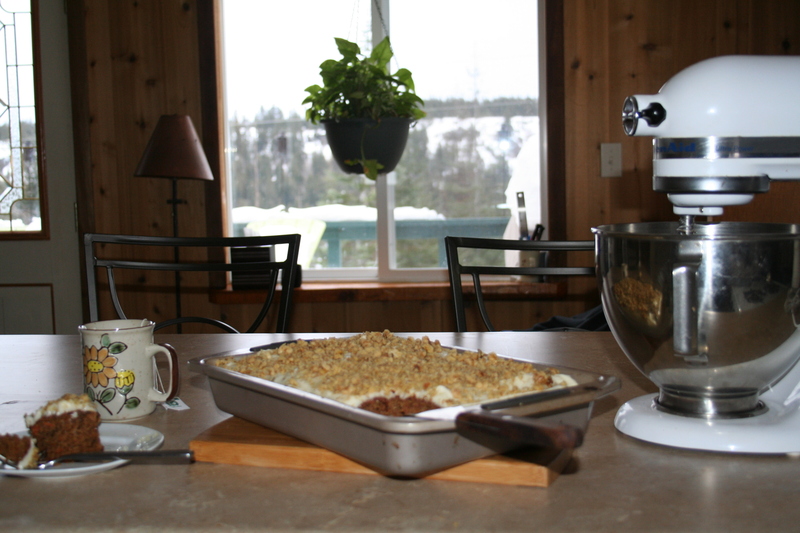 I’ve always enjoyed cooking, especially baking. I will tell you why- I like to lick the bowl. Yeah, yeah, I know it’s got raw eggs in it and we don’t have our own free-range chickens (yet). I guess I just like to live dangerously ;-). The headlines have yet to read; Woman Croaks from fatal spoon lick. You take your precautions, I’ll take mine. I even let my kids take their life into their own hands, or mouths rather. We had a ‘1st to call it, gets it’ rule. “I want to lick the bowl!” Yells one kid, “drat”, yells the other. Licking the beaters is a treat too! Back before my monster mixer, there were 2 beaters and I have 2 kids, shwew. And hey, who doesn’t love cookie dough!? When he was little, my son had this cute little habit of asking “is this homemade?” My mom thought it was adorable, it pissed my then mother-in-law off. You see, one of those women loved to cook, the other, did not. Before I met Lance I use to ‘cheat-bake’. I’d get a cake mix, a box of brownie mix or a banana bread kit. I’d follow the directions, but embellish to make it my own. I’d add chocolate chips to the brownies, a streusel topping to the banana bread or use coffee in place of water for a chocolate cake. My friends, family and co-workers thought I was a splendid baker. Truth be told, coworkers will eat anything you bring in and a delivered loaf of warm banana bread to a friend was like a bar of gold to a king. Lance is much more pragmatic (a word I still have to look up to make sure I’m using it right). One day when I was adding a bunch of extra ingredients to a skillet full of Ragu, he asks, “why don’t you just make your own sauce?” “Um, aah, well, it’s easier to have a starting place”. Well, it didn’t take long for me to read ingredients (what IS 1/2 this stuff? 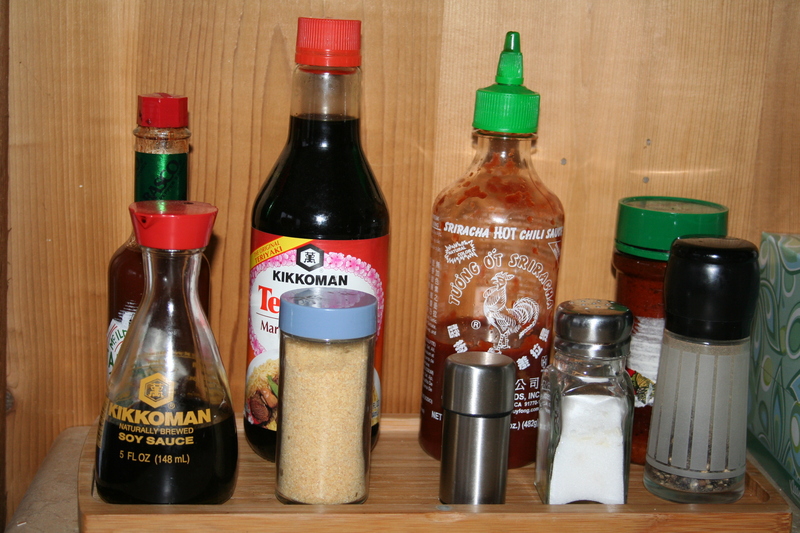 ), compare pricing and research some recipes from scratch. Now, I rarely use a box or jar for anything. It’s a little more work, but tastes alot more better. Today I’m resting up from recent snow shoveling pains. I decided to bake myself a cake. Tomorrow IS my birthday. I researched ‘healthy cakes’. One interesting one showed up using black beans instead of flour. I didn’t feel THAT adventurous, so I made carrot cake. Our fridge is full of leftovers. I love finding healthy, cheap recipes that Lance will devour. I confess I lack the ‘seasoning skills’ he has. He seems to have the magic touch (yes, I’m a bit smitten). Check out our kitchen pantry door (alphabetized, of course). I use to think if you could read a recipe, you could cook. Often I whip up a batch of some such soup, taste it and say ‘eh’. Then I ask the seasoning master to work his magic on the kettle full of correctly measured ingredients that lack taste. Here is his daily artillery (kept on the counter due to frequent use). Often he’ll go to get a late night snack and ask if I’d like anything. I say, “Yes, make 3 extra spoonfuls of whatever you’re getting yourself”. A woman after my own heart. 🙂 I too love cooking and baking, though I’m no good at “canned chefery”. James is the king of canned chefs. You know, where you take all canned or boxed ingredients and whip something up. I prefer cooking from scratch. Something about cutting up veggies and fresh herbs, or baking using all your own ingredients, makes the dish/dessert smell and taste better, I swear! But canned chefery has its benefits … it’s quite fast and good in a pinch. 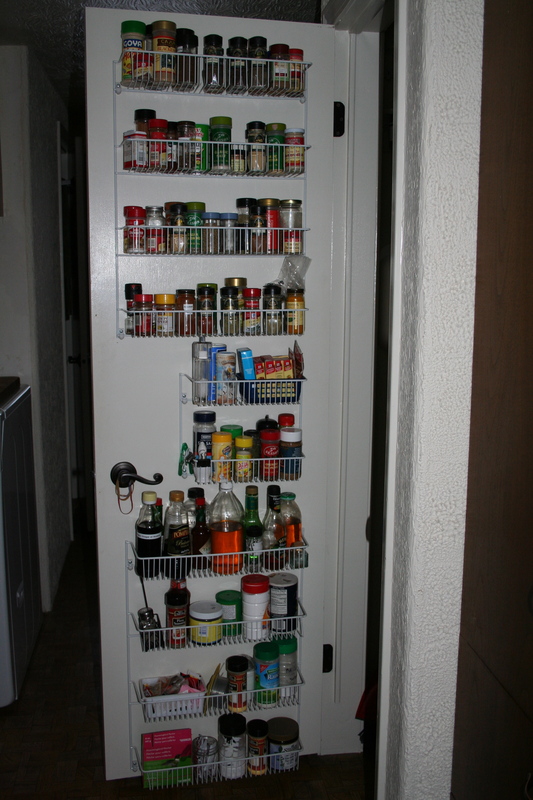 Oh, and Lance’s uber-organized pantry makes my type-A side inwardly squeal with delight, lol.